Enjoy going through the collection of best quotes from The Avengers (2012). The Avengers is a movie set in Marvel Universe and sometimes called Marvel’s The Avengers. If you’re in need of refreshing your memory before jumping in the quotes, here is a short summary of the plot. When the mysterious and unpredictable power source called the Tesseract is stolen by Loki from S.H.I.E.L.D. agents to rule the entire world the Avengers have to unite and stop Loki and his infinite wrath. The S.H.I.E.L.D. head named Nick Fury tries to gather these mighty heroes and prepares them for a mighty battle. Sorted chronologically as quotes appear in the movie. The Other: The Tesseract has awakened. It is on a little world, a human world. They would wield its power, but our ally knows its workings as they never will. He is ready to lead and our force, our Chitauri, will follow. A world will be his. The universe, yours. And the humans, what can they do but burn? Nick Fury: Is there anything you can tell us about the Tesseract that we ought to know now? J.A.R.V.I.S. : Sir, the telephone. I’m afraid my protocols are being overridden. Pepper Potts: I didn’t know that either. Tony Stark: Apparently I’m volatile, self-obsessed, don’t play well with others. Loki: Kneel before me. I said kneel! Is not this simpler? Is this not your natural state? It’s the unspoken truth of humanity, that you crave subjugation. The bright lure of freedom diminishes your life’s joy in a mad scramble for power, for identity. You were made to be ruled. In the end, you will always kneel. 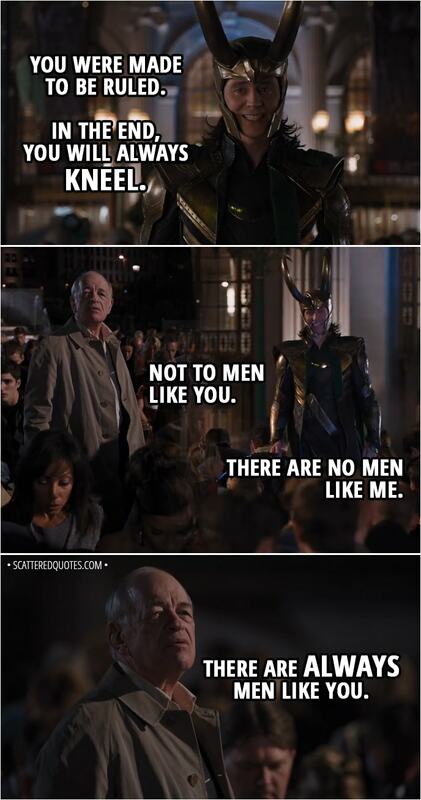 Man: Not to men like you. Man: There are always men like you. Thor: You listen well, brother. Tony Stark: Then don’t take my stuff. Thor: You have no idea what you’re dealing with. Tony Stark: Shakespeare in the Park? Doth Mother know you wear-eth her drapes? Thor: This is beyond you, metal man. Thor: Have care how you speak. Loki is beyond reason, but he is of Asgard. And he is my brother. 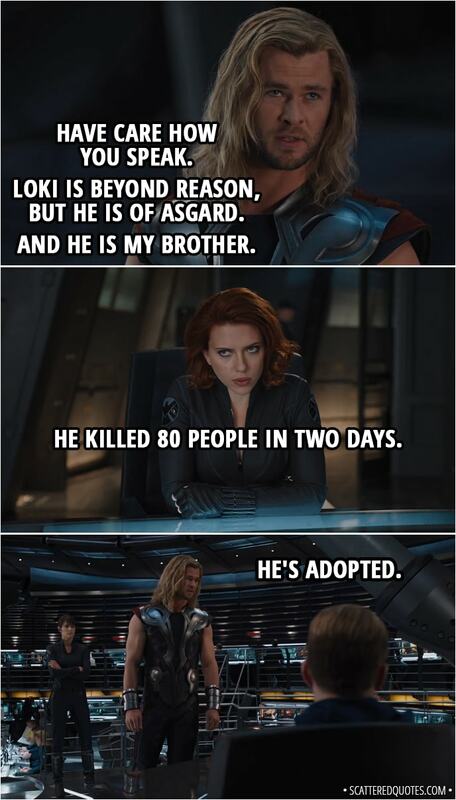 Natasha Romanoff: He killed 80 people in two days. Tony Stark: Raise the mizzenmast. Jib the topsails. That man is playing Galaga. He thought we wouldn’t notice, but we did. (covers one of his eyes) How does Fury even see these? Tony Stark: The only major component he still needs is a power source of high-energy density. Something to kick-start the Cube. Maria Hill: When did you become an expert in thermonuclear astrophysics? Steve Rogers: You think Fury’s hiding something? Tony Stark: He’s a spy. Captain, he’s “the” spy. His secrets have secrets. Tony Stark: You’re a laboratory experiment, Rogers. Everything special about you came out of a bottle. Guard: Are you an alien? Guard: From outer space, an alien. Guard: Well, then, son, you’ve got a condition. Tony Stark: Would you like a drink? Loki: Stalling me won’t change anything. Tony Stark: No, no. Threatening. No drink? Are you sure? I’m having one. Tony Stark: The Avengers. That’s what we call ourselves. We’re sort of like a team. “Earth’s mightiest heroes”-type thing. Tony Stark: Yeah. It takes us a while to get any traction, I’ll give you that one. But let’s do a head count, here. Your brother, the demigod, a super soldier, a living legend who kind of lives up to the legend. A man with breathtaking anger-management issues, a couple of master assassins, and you, big fella, you’ve managed to piss off every single one of them. Tony Stark (to Loki): Maybe your army comes and maybe it’s too much for us, but it’s all on you. 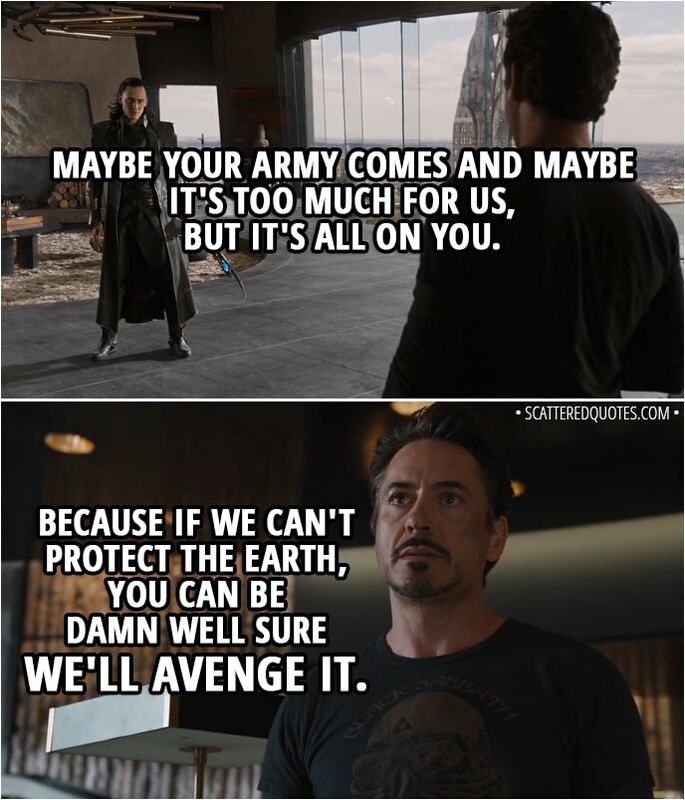 Because if we can’t protect the Earth, you can be damn well sure we’ll avenge it. Loki: How will your friends have time for me when they are so busy fighting you? (he touches him with sceptre and nothing happens) This usually works. 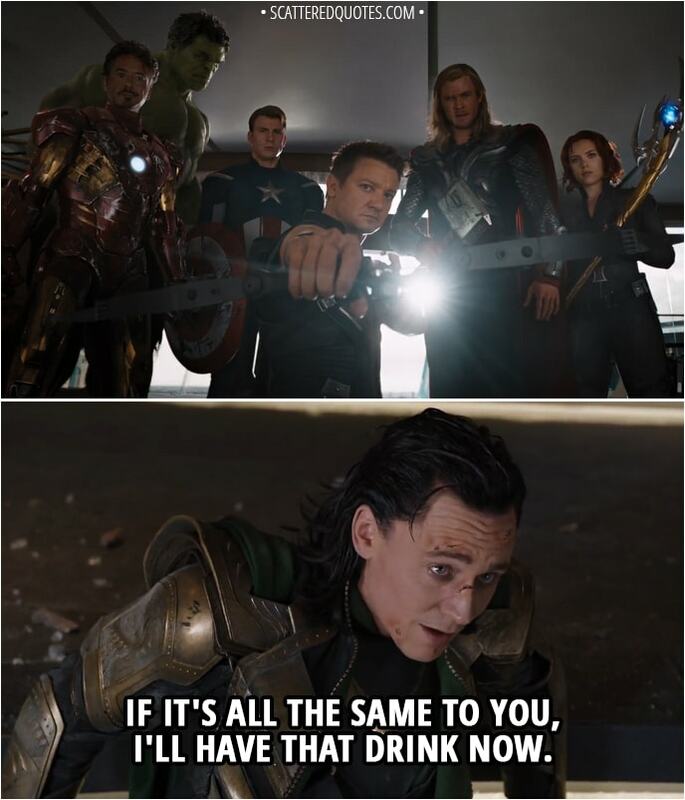 Loki: If it’s all the same to you, I’ll have that drink now. The World Security Council: I don’t think you understand what you’ve started, letting the Avengers loose on this world. They’re dangerous. • What did you think about The Avengers? • And as always: What is your favorite quote from the movie? If you enjoyed this list, please consider sharing it. We’d appreciate it, thank you!